Book a visit to our showroom where we have a wide variety of products on display for the catering and hospitality trade. If you're in need of a new range of glassware for your pub, or your restaurant needs a revamp with some new crockery and tableware lines, just book an appointment with our Trade Sales team and they can give you a hands-on with our product ranges. Please book an appointment before visiting our showroom. 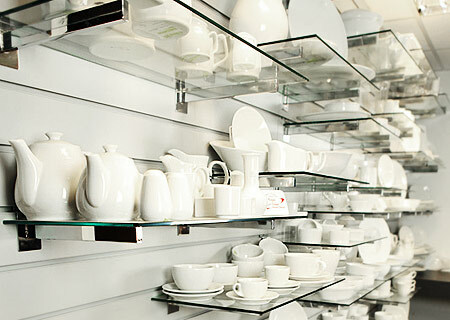 Our showroom is available to trade customers to ensure we can give you the best possible service. It is essential that you Book an Appointment with our Trade Team so the most appropriate team member is available to show you the products you are interested in. Where is the Drinkstuff Showroom? We are located just off the A10, south of Cambridge, in Melbourn, Hertfordshire. Find Drinkstuff on Google Maps for full directions. When is the Drinkstuff showroom open? How can I contact Drinkstuff?